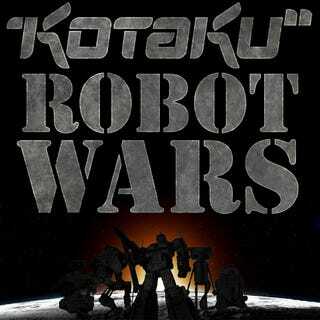 Kotaku's newfound obsession with robots hs drawn mechanical video game characters from throughout time and space to do battle in the Robot Wars - and only you can decide who lives and who dies! The interspatial beacon high atop Kotaku tower has harnessed the power of our latest obsession, forging a temporal reality scoop that is gathering robots from throughout the history of gaming to do battle across the globe. From Optimus Prime to Mega Man, Chrono Trigger's Robo to Disgaea's Thursday, thirty-four robots both obscure and world-renowned gather to determine once and for all who is the world's mightiest video game robot. The United States military, startled by the sudden appearance of so much autonomous robot firepower outside Kotaku's main tower in Colorado, detonates a nuclear warhead in the heart of Denver, hoping to wipe out the metal menace once and for all. As the mushroom cloud subsides, only eight of the thirty-five combatants are left standing, rising from the rubble determined to carry out their prime directive: kicking each other's metal asses from here to this Friday. Your task for today: vote for your favorite gaming robot from the list below, with the top eight facing off against one another in a single elimination tournament...well, unless you count the massive loss of human life that will surely ensue. We're not. Cast your vote, and then come back tomorrow to see who is left standing when the smoke clears!